The two most important assets of any company, brand value and people value, are unfortunately not on the books. While brands have slowly made there way onto the financial reports, marketers are still not on the books as valued and valuable resources. While there are awards for campaigns or for short-term successes, e.g. “Marketing of the Year”, there is no recognition for the people who have made tremendous contributions to marketing overall, and over a number of years. This year the Marketing Hall of Fame is inducting 3 individuals who have shown their innovation, leadership, inspiration and success over time, and often across multiple disciplines. This year we are celebrating brilliance in marketing, by focusing on the people behind the brands. Marketing Hall of Fame to the people who make outstanding contributions to the field of marketing and are inspiring and educating the next generation of marketers. I am glad to hear that you are reviving the Marketing Hall of Fame and centering it on awarding people. And he is already putting in nominations. I invite you to do the same. Can a logo drive business results? Absolutely. There is one brand that saw a 20% change in their business within 7 weeks of changing their logo and packaging design. Yes, that’s right, CHANGE IN LOGO RESULTS IN 20% CHANGE IN SALES IN 7 WEEKS. 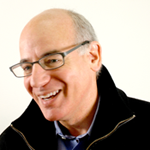 There were no other changes during that time which would account for such a dramatic change in business performance — the product stayed the same, distribution the same, pricing the same. Everything was the same except for the new logo on the package. 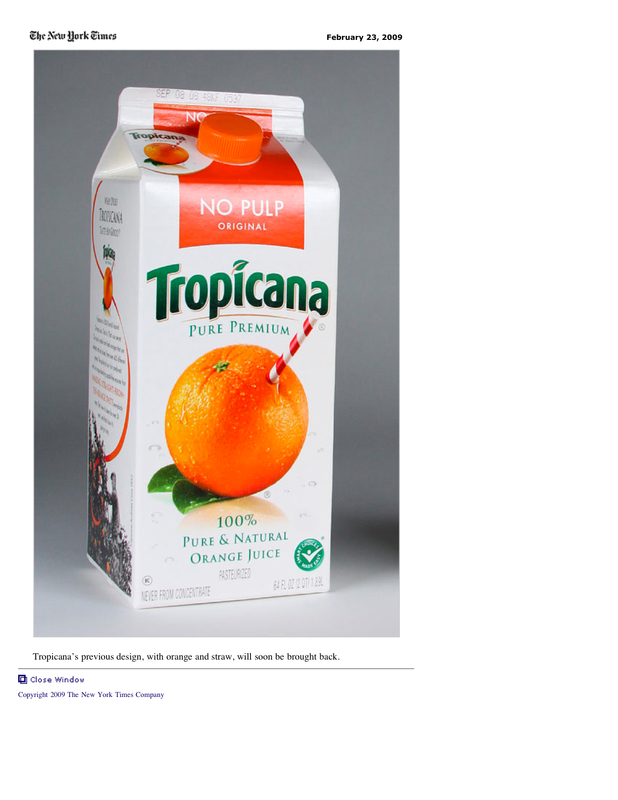 NEW YORK (AdAge.com) — After a package redesign, sales of the Tropicana Pure Premium line plummeted 20% between Jan. 1 and Feb. 22, costing the brand tens of millions of dollars. On Feb. 23, the company announced it would bow to consumer demand and scrap the new packaging, designed by Peter Arnell. I was reminded of this astonishing business result by the stories about Arnell Group finally closing its doors. Is the glass half empty or half fully? One of my secret vices is reading a book while walking down the street. Now, since our offices are just off of Times Square, I reach a point where I just have to put down the book and look around me. 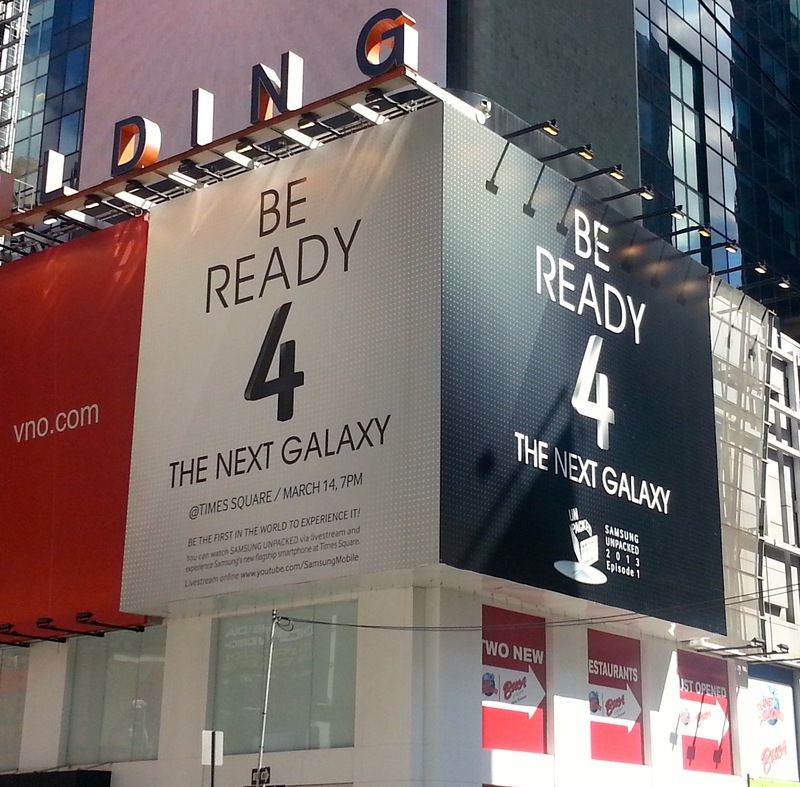 As anyone who has walked through Times Square lately can tell you, Samsung is launching the Samsung Galaxy S IV right there, tomorrow evening. While I was admiring all of the digital billboards for the Galaxy S 4, I had to do a double take. LG is engaged in their own guerrilla tactics. It just fits in with all of the other “4” billboards wrapped around the neighborhood. Honestly, I didn’t even realize that the LG billboard was trying to poke fun at Samsung until I looked at the photos later in the day. 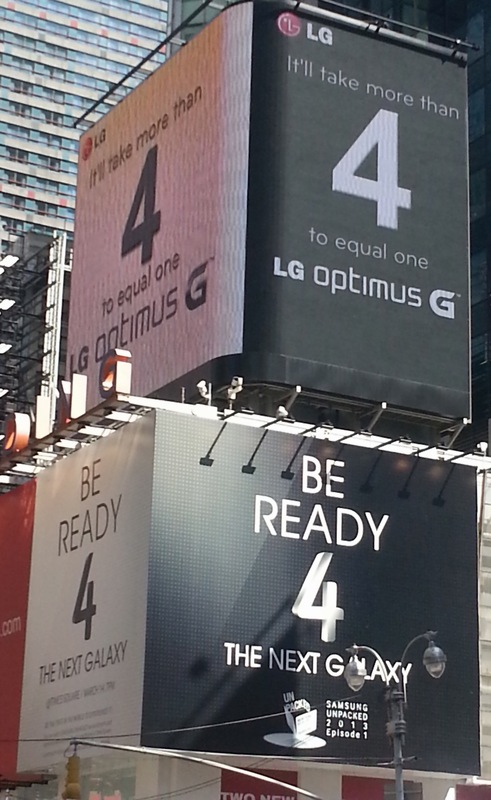 “It will take more than 4 to equal one.” With the visual emphasis on “4” LG is actually hurting their own cause. Their spending is reinforcing the Samsung message. Times Square is crowded visually, LG needs to have a better storyline to stand out. There is no stopping power to their advertising. Full disclosure, while Samsung is a client of Verse Group, we did not participate in this unpacked event.